Love it or hate it, The Taurus Judge has been around for a while now. In case you’ve been under a rock (or if you just ignored those strange looking things in the corner of your gun shop’s case), the Judge, pictured at right, is a Taurus revolver capable of firing both .410 shotgun shells and .45 Colt rounds. Taurus also offers other flavors of Judge revolvers which can add .454 Casull rounds into the mix. 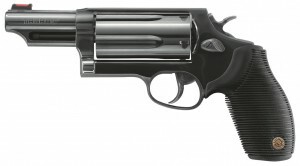 The revolver, formerly model 4410, gained the Judge moniker in 2006 after Taurus Executive VP Bob Morrison learned that the firearm was becoming popular for courtroom self-defense with judges in high-crime areas. The Judge line of revolvers is marketed as a short-distance self defense firearm and is also enjoying some popularity as a “snake gun” or “rat gun.” Despite numerous critics of the platform, the Judge line seems to be selling briskly and is reported to have become Taurus’ top selling firearm. Perhaps to the chagrin of those critics, Smith & Wesson has entered the market with their answer to the Judge: the cleverly named Governor, which also fires .45 Colt and 2.5″ .410 cartridges but also introduces the ability to fire .45ACP rounds.